Discover the lives of the men that forever changed the course of history! This book contains the fundamental history, early influences, life-changing events, and lasting impact of historical figures such as Moses, Alexander the Great, Napoleon, Gandhi, and many others! The 21st century stands witness to the achievements of some of the most influential men in the world. And yet, no matter how today's movers and shakers stand in contemporary rankings, how can we compare them to the giants of the past, the men who took history in their bare hands and bent it to their will? Whether they strode upon the stages of military power or at the altars of religious belief, they have left their marks on civilization. Destiny is both unpredictable and fickle. Jesus, Napoleon, Moses, Julius Caesar, Saint Paul, Alexander the Great, Gandhi, and Muhammad were men whose lives changed the course of history. They would have been remarkable in any era in which they were born. But by living when they did, each defined the times in which they lived. Their actions transformed the imprint of their countries and the world. 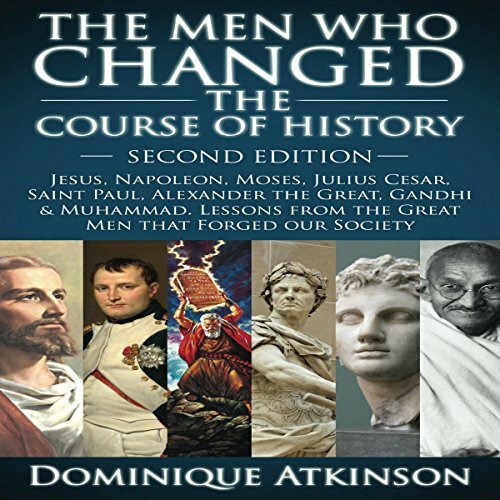 The body of knowledge around this subject is so extensive that Dominique Atkinson has skillfully compressed thousands of books, scriptures, and teachings of these historical figures into this easy-to-listen-to book. For each of these great men, you will learn who they were, where they came from, who influenced them, the fundamental turning points in their lives, and their lasting contributions to the world.